GRI Bellows metering pumps operate on a positive displacement principle. Pumps are designed to displace both corrosive and non-corrosive fluids. Accurate to ± 0.5% from stroke to stroke, when pump is set 50% to 100% of full stroke. Discharge pressure is maintained over the entire flow range of the pump. 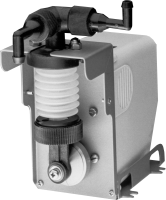 Poppet valves are utilized to prevent backflow; and springs are available to provide a positive shutoff, preventing siphoning through the pump in applications where a positive suction head exists. Typical applications include film and x-ray processors, silver recovery systems, wafer and silicon chip washers and processors, detergent dispensers, blood analyzing equipment, industrial floor scrubbers, thermo therapy equipment, waste removal systems, and wastewater and water treatment systems.